Pelletron offers PRM and PRH series powder valves. 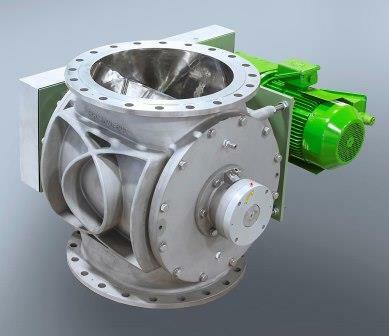 Efficient and reliable conveying of all kinds of powders needs high-quality rotary valves. Pelletron’s PRM and PRH series powder valves are available for various differential pressure applications from 22 to 50 psi. Depending on the pressure, the closed-end rotor is equipped with 12 or 14 vanes with beveled rotor tips. The valves are available for conveying capacities of 5,000 to 200,000 lb/hr with inlet diameters ranging from 4 to 24 in. The valve is equipped with an integrated leakage air vent for improved filling efficiency. The heavy-duty housing and bearing support allows minimal rotor tolerance with lifetime bearings. The valves are available in stainless steel.